Councilman Steve Adams says he\'s been inspired by libertarian Ron Paul. \"They call him Doctor No,\" Adams says. Just a little over an hour in, the Coeur d’Alene City Council meeting went off the rails. Councilman Steve Adams had gone to a judicial confirmation hearing a few days earlier and announced that he had “changed [his] mind” on the approval of a $33 million bond. The money would go to pay for a federally required wastewater treatment upgrades, but despite voting for it, Adams was now fighting it. City Attorney Mike Gridley concluded then that Adams was an “adverse party” and wouldn’t discuss any legal strategy over the facility with Adams in the room. Then, with the March 5 council meeting, it all boiled over. Adams threatened to file an ethics complaint against Gridley, and another councilman made a motion to exclude Adams from legal discussions. The arguments grew heated. “— you are out of line then, Madam Mayor,” Adams interrupts. With that, Bloem smacks her gavel down on the table. “Five minute break,” she says, standing up abruptly from her chair and leaving the dais. Councilwoman Deanna Goodlander, sitting at a bakery just a few hundred feet away from McEuen Field, seems weary. Much of the division began with McEuen Field. Earlier this week, construction resumed on the overhaul of the lakeside park, which sparked protest and catalyzed a mayoral recall attempt. 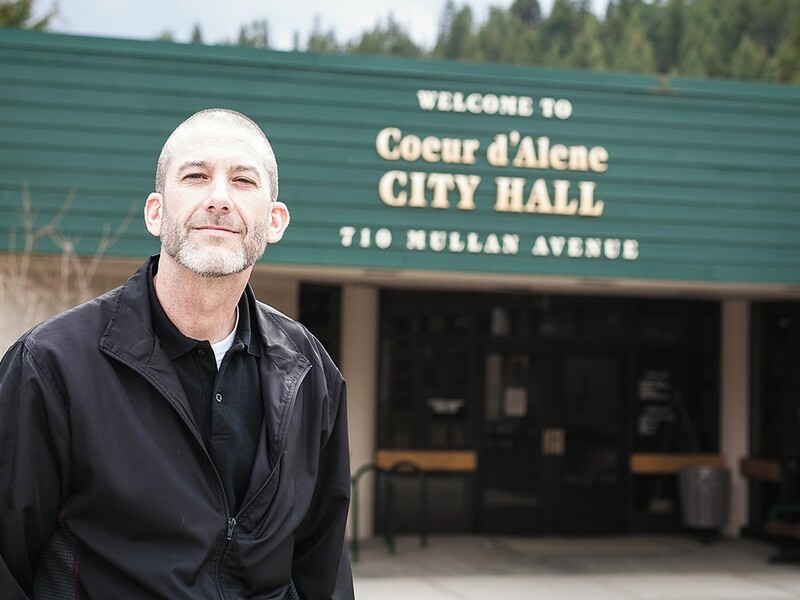 The outrage over McEuen catapulted two members of the Kootenai County Reagan Republicans — Steve Adams and Dan Gookin — to the City Council. They promised to fight for a public vote over the field plan. They didn’t just want to stop the changes to the field, they wanted to kill the urban redevelopment agency leading them. But despite sweeping the 2011 election, the opponents of the McEuen plan remained outnumbered, and the field’s progress continued unabated. And for one moment last summer, it looked like Adams was going to give up fighting against the field. “I’ve effectively conceded,” Adams said, voting to support a replacement for McEuen’s ball field. But his criticism of the field continued, and an underlying ideological rift remained. “McEuen field isn’t the main issue. Not anymore,” Goodlander says. “It’s a philosophical difference.” Goodlander says she’s been a lifelong Republican, but Adams isn’t conventionally conservative. Describing his political philosophy at Calypsos Coffee & Creamery, Adams cites his discovery of libertarian Ron Paul. Paul relies on a strict, unconventional interpretation of the United States Constitution, while Adams has a strict, unconventional interpretation of the Idaho State Constitution. He repeatedly cites Article 8, Section 3 of Idaho’s Constitution. That section stops cities from going into debt without a two-thirds public vote, unless they need to pay for “ordinary and necessary” expenses. It also allows voters to approve new facilities like water treatment plants with a simple majority vote. But it’s up to a judge to determine if a project is “ordinary and necessary.” At first, Adams thought the treatment plant upgrades, required to meet federal pollution standards, qualified. But a last-minute conversation with one of his advisors convinced Adams otherwise. In the judicial hearing, he gave the example of a judge refusing to issue Boise a bond for a new police station. But in that case, the major factor was that the police station was a new facility. Most bonds for upgrades and improvements, by contrast, have been approved. “It is a constitutional method — and has been used for years and years and years and years and years and years — to approve projects like sewer wastewater treatment plants,” Gridley said at the March council meeting. In fact, in 2007, a judge approved an earlier bond to upgrade Coeur d’Alene’s facility. Adams’ sudden opposition made him an “adverse party,” Gridley maintains. But Adams doesn’t buy it. He doesn’t think the judicial hearing counted as litigation and asked Gridley to write down his rationale. Gridley offered to explain in front of the entire council, but refused to give it to Adams in writing. Gridley, who has come under fire for being disrespectful to Adams, says he’s tired of people who dish it out, but can’t take it. Gridley and other critics of Adams will have to be patient. Adams, Gookin and veteran McEuen opponent Ron Edinger have three more years left on their terms. Their political rivals, however, are up for election this November.